It's not enough to knit sweaters for our children and grandchildren. Dexterous fingers need more. They need to knit something smaller, faster. They need to knit hats for cats. What started as a lark and to honor the grandmother who taught her to knit has turned into steady work for Sara Thomas. She is the author of "Cats in Hats: 30 Knit and Crochet Patterns for Your Kitty" (Running Press, March 2015). Thomas hopes the book will free up time so she can knit and crochet something else. The book offers quick knitting and crochet patterns. There are patterns for a dinosaur, chicken, bunny, turkey, cupcake, extraterrestrial, banana, Santa, elf, lion, fox, dog, baby bear and more. 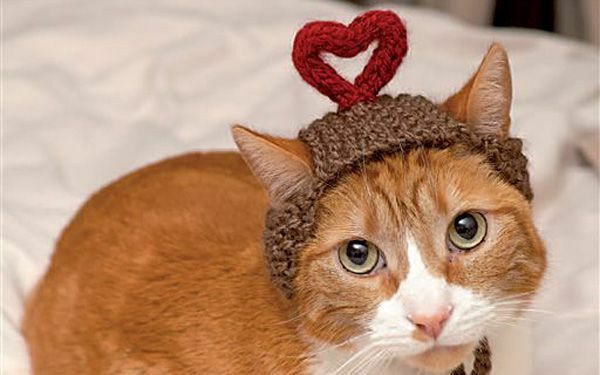 "As much as I love the cat hat, I do want to do other things," admits Thomas, of Nashville, Tennessee. In 2009, Thomas launched her Etsy shop, Scooter Knits, with disparate handmade items. They included one hand-knit kitty hat, which quickly sold. She's been crocheting tiny hats for feline companions ever since. In 2012, she had her biggest year, selling 300 kitty chapeaus (the holiday hats sold best). Thomas sometimes crocheted until 4 a.m. to fill the orders. Hannah Milman, editorial director of Crafts at Martha Stewart Living, isn't surprised. "People love their pets. It's 'the new baby.' So it's no wonder people want to create personalized, wearable gifts for their pets," Milman says. "A large part of it is also social media .... Who doesn't love seeing cats or dogs on Instagram in cute homemade outfits or accessories?" At least one of the patterns in the book the Happy Birthday Cat Hat pattern is free at Thomas' blog. Her two cats, Dorothy and Sinclair, are first to try out her admittedly kitschy creations. Dorothy has proven agreeable. But not Sinclair. "Sinclair does not enjoy modeling the hats. In fact, he likes to attack them," says Thomas. A pattern book of hats for dogs isn't out of the question. Thomas would also like to rework her grandmother's vintage patterns for a book. "She was a beautiful knitter who grew up in Germany. So I'd want to make the patterns era-appropriate." But first? She'll probably embark on a holiday-themed book that puts more cats in outlandish hats. She has learned that hats for cats sell. Critical thinking challenge: Etsy is an online store. In what other way has the Internet helped Sara Thomas grow her business? I love some animals and one of them are cats, cats in hats any type of hat and I wonder if there is a dog in hats too. I would love to see some dogs in hats though. I think it's funny and also I like it and I think other people will like it too. If I had a cat, I would get it a Halloween hat. The hat would probably be too tiny for a dog like mine. If I were a cat i don't think i would like to wear a hat. The reason we don't put pigs in shoes or monkey's in glove sis because they aren't meant for that! We don't go walking around on leashes and cats shouldn't be walking around in hats, it's a human thing. It is a creative idea just I personally don't like it! i personally find this a unintelligent idea because i know, that my cat would hate this and would attack it and tear it to shreds. I could see you buying this for someone that loves cats but it doesn't appeal to alot of people. This article was about a girl who opened up a shop for cat hats. She knits and crochets them herself. She sold 300 hats in 2012. In 2009, she opened a shop of handmade items called Scooter Knits. She has been making cat hats ever since. 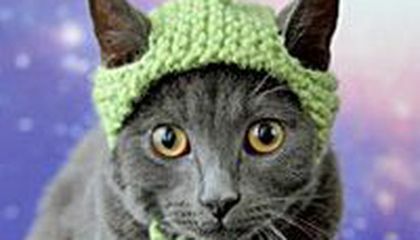 I liked this article because I never knew people made hats for their cats. I would like to buy one now. If I were to find her etsy shop i would buy all of them! although my cat may not tolerate the warm, fuzzy hat on her ears, i would take a quick picture and take it off. There is no need to to do that to a angry or disappointed cat for the much time.